When Iowa State University was established in 1858 it was as the Iowa Agricultural College and Model Farm. The name alone sent a clear message that the school’s founders wanted the students who attended Iowa State to have a strong understanding of and practical education in farming. Of course, the students didn’t all want to be farmers, but that’s a different story. 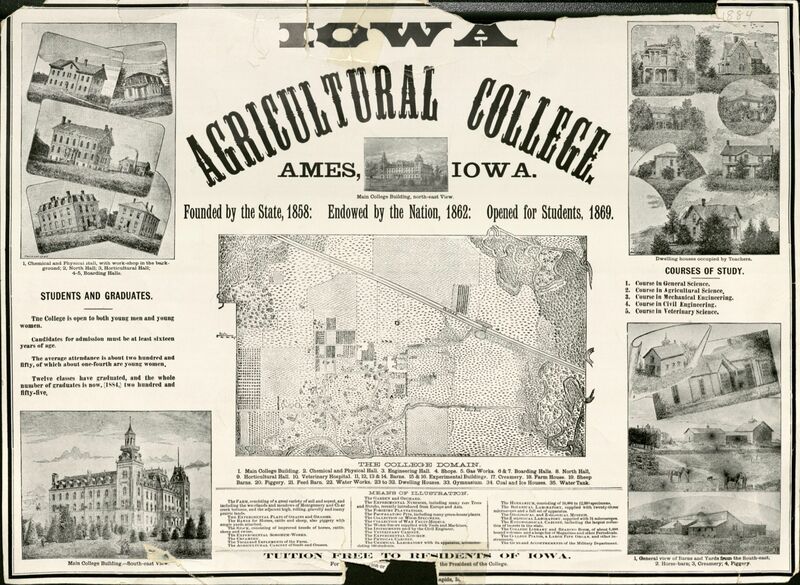 This announcement for the Iowa Agricultural College (now known as Iowa State University) shows scenes of campus as it appeared in 1884. The map also identifies the extent of the campus farm at the time. (University Photograph Collection, RS 0, oversized). In the early years, the male students were required to spend several hours each day helping out on the school’s farm and in the shops, while the female students were assigned to help with domestic chores in the kitchens and laundry. There was no tuition at Iowa State at the time, so perhaps it seemed like a fair trade. Within 20 years, the practice of requiring students to work on campus became impractical due to the complexities of organizing and supervising a workforce of hundreds of students. By the early 20th century, the Iowa Agricultural College and Model Farm had become the Iowa State College of Agriculture and Mechanic Arts and had grown to become a highly respected agricultural and engineering school. Students in agriculture still gained practical experience working with livestock, understanding how to maximize crop yields, and learning the business principles of farming. However, faculty still felt that the experience of the agriculture students could still be improved. In 1938, Dr. William Murray, professor of economics, identified that his students had no real experience in actually managing a farm. He set out to change this. Murray convinced the college administration to purchase a farm and to provide a budget for the first year of farm operations. He argued that the cost of operation should not be high—if the students apply what they learned in class then the farm should be profitable. The college administration agreed to the proposal and purchased a 187-acre farm just south of campus in the fall of 1942. The first formal Agriculture 450 class was offered in January 1943 with Murray as instructor. In March, the farm was turned over to the management of the students with the only limitation being that each expenditure and sale be approved in advance by the instructor. The farm has been in the care of students ever since. If you are interested in taking a deeper dive into the history of the Ag 450 Farm, feel free to visit Special Collections and University Archives. The Ag 450 Farm records contain account books, photographs, scrapbooks, clippings, and more documenting the history of the Ag 450 course and the farm itself. Stop in and take a look! 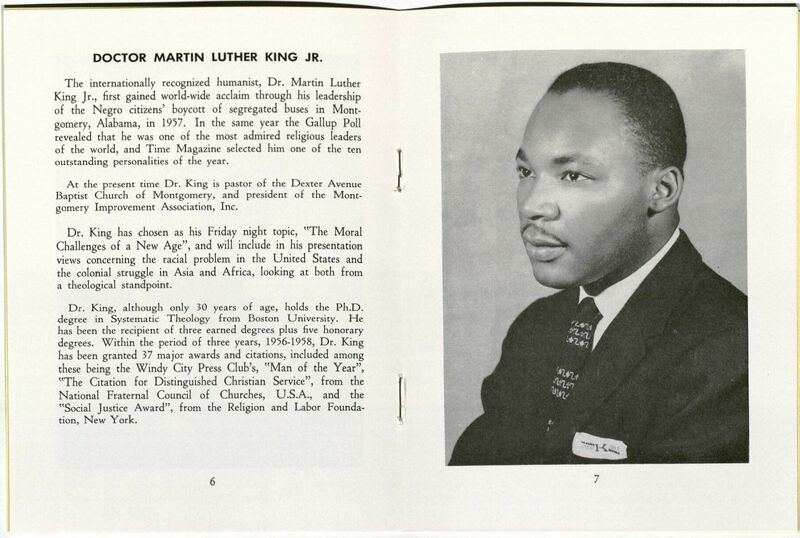 In January 1960, as part of Iowa State’s annual Religion in Life Week convocations, Dr. Martin Luther King, Jr., visited the Iowa State campus to deliver a speech on “The Moral Challenges of a New Age.” Sadly, we have no photographs or recordings of the speech, but a typescript of the speech exists in the archives, as does the program for the 1960 Religion-in-Life Week. The image above was taken from the program. If only it were possible to travel back in time, I would love to find myself sitting in the audience in the Great Hall the evening Dr. King came to ISU. A Brief History of Iowa State Bowl Games — Check Out Our Football Programs! Last week, the Iowa State Cyclones football team won the Liberty Bowl over Memphis, 21-20, in a game that went down to the wire. Longtime Iowa State football fans probably know that this was Iowa State’s thirteenth bowl appearance and only its fourth bowl victory. What longtime fans may not know is that the ISU Library recently scanned a selection of football programs from the collection held by the University Archives and those are now available to view and download from the Library’s Digital Collections! The 1971 Sun Bowl was Iowa State’s first bowl game. Coached by Johnny Majors, the Iowa State team lost to LSU by a score of 15-33. The program for the game provides some short biographies of the coaching staff and the players. How else would I know that one of defensive tackle Tom Wilcox’s hobbies is scuba diving? The following year, Johnny Majors took the team to the 1972 Liberty Bowl. Iowa State came up just short in this contest against Georgia Tech, 31-30. The program for this game is little more than a brochure. Aside from a short recap of the 1972 season and a short biography of the coach, the most interesting part is looking at the roster, which includes height, weight, and age of each of the players. Earle Bruce took over the coaching reigns after Majors left Iowa State and within a few years had the team back into bowl contention. Bruce coached the Iowa State squad to the Peach Bowl in 1977, a loss this time to NC State, and to the 1978 Hall of Fame Classic against Texas A&M. Iowa State lost the game by a score of 12-28, but they came away with this snazzy program. It would be over two decades before Iowa State would make another bowl appearance. The 2000 Cyclones squad, coached by Dan McCarney, would finally do what no other squad had previously done—win a bowl game. The Cyclones defeated Pittsburgh 37-29 in the 2000 Insight.com Bowl. Unlike the 1972 Liberty Bowl Program, the program for this game includes biographies on most players and coaches and contains a slew of statistics and recent team history. At 116 pages, it is also nearly three times the size of any of the previous bowl programs. Prior to 2017, the most recent bowl the Cyclones participated in was the 2012 Liberty Bowl, a game the Iowa State squad lost to Tulsa by a score of 17-31. Unfortunately, the University Archives does not have a copy of this program in its collections. If you have an extra copy of this program, or any other Iowa State athletics programs that you might be willing to donate, give us a call! You can find dozens of football programs on the Library’s Digital Collections website. Of course, you are also more than welcome to visit the Special Collections and University Archives and view the entire football program collection. We would be happy to see you! As the year comes to a close, it is not unusual to reflect upon the events of the past year and give thanks for the gifts that were received. This can be important for archivists to do as well. 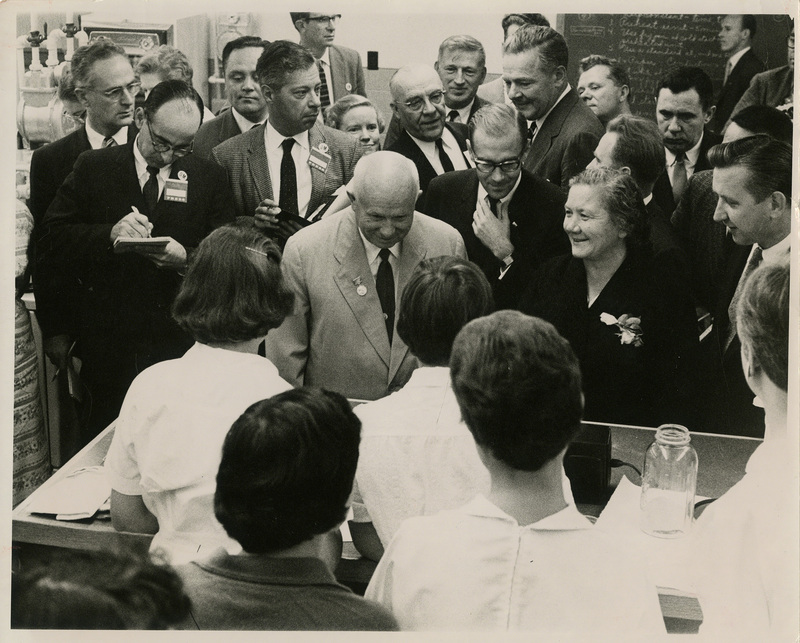 In fact, many archives, including this one, rely heavily upon the generosity of our donors. At Iowa State, faculty offer their teaching and research files, campus units transfer administrative records, and others donate cherished materials from when they or their loved ones were students at Iowa State. I have met and worked with many people this past year and as I think about those experiences, there are several memories that come immediately to mind. One that stands out for me was actually initiated over a year ago when I received a phone call from the son of Norma “Duffy” Lyon. For those readers not familiar with that name, you would probably recognize her if I referred to her as the Butter-Cow Lady. For decades, Norma’s butter sculptures were the star attractions of the Iowa State Fair. Norma passed away in 2011 and, after several years of contemplating what to do with the materials she left behind, the family made the difficult decision to donate them to the archives at Iowa State University. I met with the family last year to gather items belonging to Norma and learned about the woman whose materials were being given to our care. As I reviewed the donation, her son and his wife shared memories of Norma and related stories of Norma’s youth that they had heard over the years. Then, this past summer, the family donated additional materials. The collection is not a large one, but it does include a wide variety of items such as original artwork, sketchpads, photographs, clippings, and ephemera. One of the more interesting items donated was a binder of photographs. These photographs showed the entire process that Norma used to create the 1998 Iowa State Fair butter cow. Another wonderful piece in the collection is a book containing college ephemera from Norma’s time as a student at Iowa State. I discovered that she graduated in 1950 with a degree in animal husbandry (one of the first women to receive that degree from ISU) and had a love of art. As a student she took classes from Iowa State’s sculptor-in-residence, Christian Petersen. After graduation, Norma was able to combine those two passions and do something wonderful with them. The collection is not yet open to researchers, but during the coming year it will be processed and prepared for people to view. One of the great joys of this profession is to be able to share unique collections like Norma’s with the public. The staff here in Special Collections and University Archives takes a lot of pride in our work, but the work that we do would be impossible without the support of our donors. If you are curious about materials you have and whether they are appropriate for the archives, feel free to contact us. We would love to hear from you. The mission of Iowa State University is to “Create, share, and apply knowledge to make Iowa and the world a better place.” In support of this mission, the University offers numerous opportunities for students and faculty to explore and share with the world, but it is hardly a one-way street. People come to Iowa State from all parts of the world to share their experiences and to gain a quality education. It really is remarkable how a small agricultural college established in the 1850s in the middle of Iowa has, over the course of over 150 years, built such a strong international reputation. This reputation has been drawing international students to Iowa State for well over 100 years. Unfortunately, documenting international students and their campus experiences is not an easy task. There are very few sources available to a researcher looking for information on early students at Iowa State, regardless of their country of origin. The first students arrived on campus in 1868, but it would be another 25 years before a yearbook (The Bomb) was published. Student directories were not available either, the earliest available being from 1901. For years prior to that, the college biennial reports and the course catalogs are the best sources for information on individual students. The biennial reports include lists of students for the very earliest years and then, by the 1880s, this information was shifted to the course catalogs. It is helpful that the listings often include the names of the students’ hometowns. Based on these sources, the earliest evidence of an international student enrolling at Iowa State was in 1882 when F. Nouman of Piramaribo, South America, (this is how the hometown was listed) was enrolled for one year as a “special student,” likely meaning that he was not enrolled in the standard curriculum. In 1898 and 1899 there were several Canadian students who received degrees, though it is curious why a handful of them all appeared on campus at the same time with several of them receiving veterinary degrees. In 1902, two young men from Leon, Mexico, enrolled in the agriculture program, but neither appears to have finished their degrees. The first international students outside of North America to receive degrees from Iowa State both earned them in 1907. Delfin Sanchez de Bustamante from Argentina received an advanced degree in agronomy and Alfred E. Parr of England graduated with an advanced degree in animal husbandry. We know nothing of what happened to Bustamante following his graduation, but from correspondence in an alumni file we know that after graduating from Iowa State, Parr went on to become the Director of Agriculture and Animal Husbandry in British India. That same year, Iowa State students began organizing a campus chapter of the Cosmopolitan Club. Officially established on campus in 1908, the purpose of the club, as stated in its constitution, was to encourage friendship, respect, and understanding among men and women of all nationalities. The Cosmopolitan Club attracted students from all backgrounds, but became a home for international students especially. Please stop by Special Collections and University Archives to view these materials for yourself. Who knows, maybe you will find references to early international students that I missed! If you have materials you would like to donate to the Special Collections and University Archives to help us continue to tell the story of student life on the Iowa State University campus, please contact us. We would be happy to hear from you! With Halloween right around the corner, October is great time to be frightened. Everyone likes a little scare every now and then, right? During 1962, the October scare was very real, though. Nuclear war with the Soviet Union seemed like a distinct possibility and people’s greatest fears were on the verge of coming true. Fortunately, the event we refer to as the Cuban Missile Crisis did not result in direct military conflict with the Soviet Union, but in many ways the fear remained. During this time, Iowa State was not complacent in preparing for potential war. In September 1961, the State Board of Regents requested that Iowa State prepare a Survival Plan in the event of a nuclear attack in the Midwest. President Hilton asked George Burnet to lead the committee to prepare such a plan. Based largely upon the National Plan for Civil Defense and Defense Mobilization, Iowa State’s plan designated fallout shelters on campus, provided shelters with enough food and supplies for two weeks, and identified key personnel to take leadership roles in the event of such an attack. Extension was also hard at work helping prepare rural communities with plans to deal with nuclear fallout. If you ever wanted to learn how to build a barn to help livestock survive nuclear war, Extension gives you the answer. 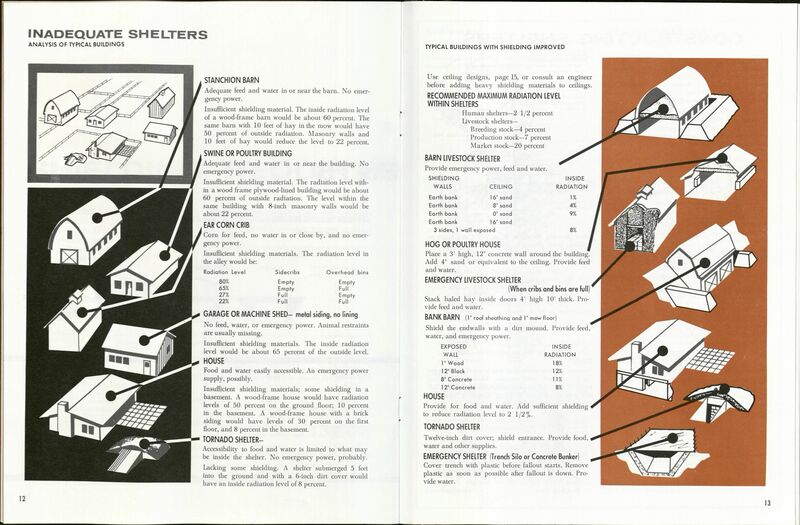 One particular publication, “Protecting Family and Livestock from Nuclear Fallout” (RCD-16), provided farmers with examples of farm structures that would help livestock survive as well as instructions on how to construct fallout shelters for people. It’s rather fascinating to look through the publication. I would be curious to know how many farmers actually built or modified their barns to take into account this possibility. If this hasn’t frightened you off and you are interested in learning more about how the University prepared for a nuclear attack on the Midwest, please feel free to stop by the Special Collections and University Archives. 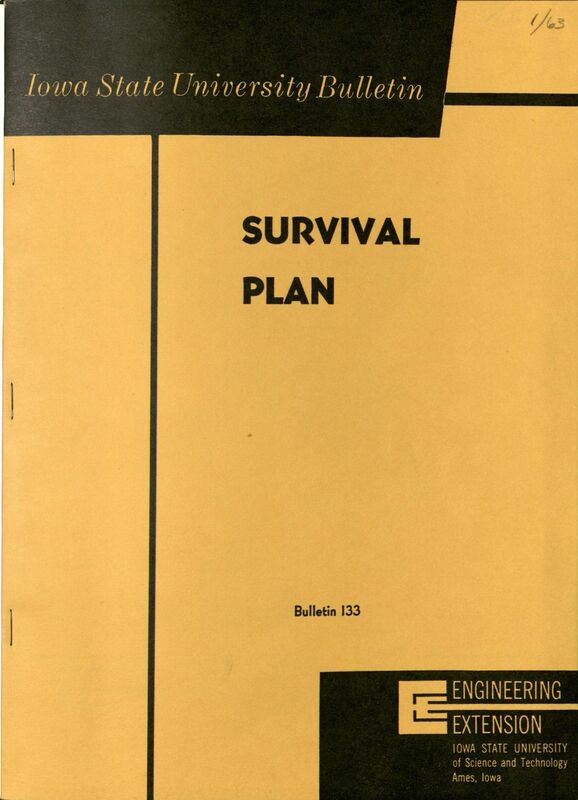 Information on the ISU Survival Plan can be found in the Survival Plan Committee records, RS 8/6/90, while publications prepared by the Extension service are available in the Extension Rural Civil Defense collection, RS 16/3/5. We look forward to scaring, I mean, seeing you!